Rome is a bustling metropolis that puts an enormous wealth of ancient history and modern culture at your fingertips. The city gives you the sense of being in a small town, despite the fact of being home to almost 3 million people. This program offers a wide range of coursework in English, plus Italian language courses, and provides rich cultural activities and excursions! To learn more about Italy, students will study Italian language and live in apartments in local Roman neighborhoods! The ISA Rome program immerses you in Italian culture and provides classes in a learning environment similar to Rollins at the American University of Rome. Due to its diversity of course offerings, ISA Rome is a good fit for students studying many subjects, including Anthropology, Studio Art, Economics, Business, Classics, Communications, Film, Critical Media and Cultural Studies, History, Political Science, International Relations, English, Religion, Sociology, and several other areas. In addition, the program offers regular excursions, cultural activities, community service opportunities, and various student clubs, organizations and sports. Students on this program must take 5 courses. Jan 21: Depart from U.S.
ISA's website sometimes lists your first travel day as the first day of the program. For example, if ISA's website says that the first day of the program is the 15th and that orientation is the 16th, then technically the first day of your program is the 16th - the day of orientation. This is because nearly all flights departing the U.S. for Rome will be overnight flights. Meaning that if you need to be in Rome on the 16th for orientation you will need to leave the U.S. on the 15th. If you're traveling from another country, just keep in mind that the first day of your program will be the first day of orientation. ISA arranges an airport pick-up in Rome for all students arriving on the scheduled date and time. After settling in and unpacking, you'll enjoy a few days of orientation, with scheduled sessions and events with ISA staff and at AUR. ISA will provide tours of the city and introduce students to the historical context of Italy and Rome. You will be responsible for booking your own flight. Based in Austin, TX, International Studies Abroad (ISA) has been providing college students in the U.S. and Canada with engaging study abroad opportunities for over 25 years. ISA offers students a wide range of academic settings, campus cultures and extracurricular options through an established network of reputable host institutions from around the world. The organization is committed to promoting cultural discovery through knowledgeable and professional onsite staff and an array of activities, excursions, housing options and support services for all of its students in its many locations. AUR is a small, internationally-recognized liberal arts institution with a diverse faculty and student body. It was founded in 1969 and enrolls between 500 and 600 students from 40 different nations. With a faculty-student ratio of just 16:1, AUR offers a learning environment similar to Rollins. Opportunities for courses with field trips and activities in Rome are also available. All courses are taught in English by AUR faculty. In addition, ISA has a 5-person staff onsite in Rome including a Resident Director, an Assistant Resident Director/Housing Coordinator, an Academic Coordinator and two staff members overseeing Student Services. The ISA Rome office is just two blocks from AUR. All students must take one Italian language course and may then choose four additional courses from within AUR’s course offerings. Courses are available in the following fields; Anthropology, Arts, Business, Classics, Communications, Economics, History, International Relations, Literature, Music, Political Science, Psychology, Religion, Sociology, and there are limited offerings in Science and Mathematics. With the exception of Italian, all courses are taught in English. 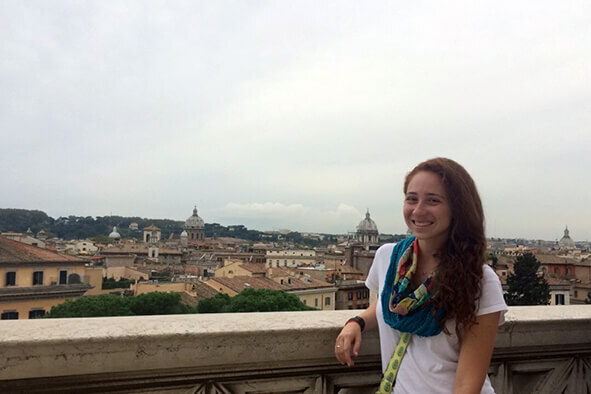 Some of the courses at AUR include activities/excursions in Rome as part of their coursework. However, these activities/excursions may come at an additional cost, so please make sure to read all course descriptions before making any final decisions. Foreign Language Competency WARNING: Italian 101 in Rome does not fulfill the Foreign Language Competency. You cannot take Italian at Rollins, and so will have a hard time fulfilling the Foreign Language Competency if you wish to continue language study after your time in Rome. You will most likely need to fulfill that requirement with a different language taught at Rollins. Nearly all content courses (economics or film, for example) at AUR are worth 3 Rollins credits. In turn, students will take 5 courses at AUR and earn a total of 15 Rollins credits. Students participating on this program will need to seek approval for courses in their major/minor (from the appropriate academic department) and for general Rollins credit (through Student Records). All courses on this program will appear on the Rollins transcript as transfer credit. Grades from this program will also appear on the Rollins transcript and will be factored into the Rollins GPA. Students who successfully complete this program through Rollins will receive an official transcript from AUR. It can take up to 3 months to receive the official transcript. ISA Housing provides the opportunity for students to experience aspects of the Italian lifestyle that are inaccessible to the average visitor of Italy. All students live in shared, fully-furnished apartments in the neighborhoods of Trastevere, Monteverde, and Gianicolense within a 30-minute commute of AUR. These neighborhoods are on the west side of the city, just south of the Vatican, and tend to be a bit quieter. They’re quite close to the historic center of Rome and conveniently located for access to public transportation. The buildings are not student housing, you’ll live in actual apartment buildings with local Romans. There are generally only one or two student apartment units per building, and neighboring residents are typically middle-class Italian families who own their apartment. Most ISA apartments have 2-3 bedrooms, lounge/living room, kitchen and bathroom(s). Bedrooms are typically double-occupancy and apartments are always single-gender. Each apartment is equipped with basic furnishings and supplies, including one single bed (per student), bed linens and towels, a closet/clothing storage space, basic cookware and kitchenware, a table and chairs and furnished sitting area. All apartment units include WiFi and a washing machine, but they will not include a dryer. Please Note: Each student will be charged a $500 refundable housing deposit by ISA. This deposit is the responsibility of the student and is refundable, less any damages caused to the apartment. There is no meal plan for this program. Students are expected to use the shared kitchens in their apartments and to buy groceries and cook meals. The ISA staff plan regular cultural activities in Rome for students. These activities vary term-to-term, but might involve meeting locals and practicing Italian, sampling Italian cuisine, and participating in local festivals and events. Students also have access to the activities available through AUR's Student Life Office. The activities and facilities offered through AUR strive to promote students’ personal growth, leadership development, social responsibility, multicultural competence and intellectual inquiry. AUR also hosts a small handful of clubs and organizations, such as the Film Club, Yoga Club, Spoken Word Club, and some sports clubs. In addition, ISA has a small office very near to AUR. The office has a “homey” and welcoming feel. In the office, students have access to free WiFi, a meeting room and lounge, TV and DVD player, a library of travel, academic and city specific resources, computers and a kitchen facility. ISA also includes day and overnight excursions to locations of interest in Italy. While excursions vary term-to-term, past locations include the island of Capri, the town of Sorrento, the ruins in Pompeii, Florence and the Chianti region, and the medieval hill towns of central Italy. In addition, students can also participate in excursions offered through AUR—these are an additional cost but are subsidized by the University so are offered at a great, discount price. Tuition and program administration, accommodation, complete medical and emergency insurance, orientation, and some activities and excursions.